We have kept the same numbers that we had last week, the billfish is getting a bit closer over the Pacific side, despite the cold front that came from the North at the beginning of the week, with 28 mph heavy winds and unusual dust storms that kept us away from fishing one day, we managed to have billfish and inshore action!. 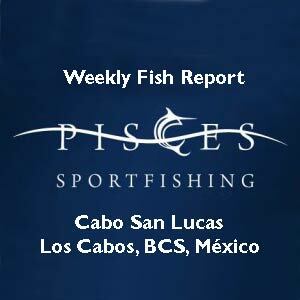 Pisces 35ft “Listo” ran to Los Arcos, 15 miles over the Pacific side and reeled a 130 lb. Striped Marlin for Steve Murchin, Colton Sudberry and Jason Rogers from San Diego, California. Pisces 25ft “Poseidon” panga got two Marlin and Spanish mackerel with live bait at El Faro for Steve Kovach and John Massotust from California. Pisces “Yahoo” 42ft Bertram did a great job and found a 180lb. Striper at Los Arcos for Cliff Cook, Sam Smiley and Alan Wood visiting from Columbus, Ohio. Barcos Piscis, S.A. de C.V.
Telephone Mexico: Tel : 011 52 624 143 1288, Fax : 011 52 624 143 0588. Local calls do not need “011 52”. This entry was posted in cabo san lucas, Fish Reports, Pisces Sportfishing, sportfishing and tagged cabo san lucas, fish report, Pisces Sportfishing on March 12, 2016 by Ismael Flores. Fishing Hot 10 Miles North of Todo Santos! All Fishing Action on Pacific Side!! Striped Marlin All Over Map? Yellowtail: Some 30lbs Being Caught? Small Roosters, Grouper and Snappers Jigging Iron! 2 Red Snapper Recipes Inside!! JC,s Baja Rum Punch Cocktail !! JC Says: “Fish Report Boy is a Jackass”!! Chris Shouted: I don’t Like Fish Report Boy at All!! Fish Report Boy says: JC is the Willie Wanka of Mexico”!! JamieB says: “Fish Report Boy is a Drunk”!! Darrel says: “Id Like to Punch Fish Boy”!! The Brits say: JC, a Chef ? What a Joke, That Old Bloke Cant Cook. JC is a fraudulant Marlin Guru who thinks hes a master chef ? The guy cant even cook a piece of Wahoo!! This entry was posted in cabo san lucas, Fish Reports, JC’s Sportfishing, sportfishing and tagged cabo san lucas, fish reports, JC´s Sportfishing, sportfishing on March 8, 2016 by Ismael Flores. We start this week with an off season Blue Marlin spotted 27 miles over on the Pacific side, guided by Captain Ricardo Escamilla on Pisces 42ft “Yahoo”, Tony Foth from Iowa and his friends were in search of Yellow fin tuna, when they spot on the horizon Marlin on the surface. Thinking it was a Striped, the crew set up a 40 lbs. test line to get it cast. What was their surprise when they hooked a 180lb Blue Marlin! Pisces 31ft “Ruthless” vessel released the first Striped Marlin of the week over the Pedregal area, estimated weight 120lbs. good fun for Todd, Cindy Fink and Tonda, Steve Devault visiting from Saginaw, Michigan. Pisces “C Rod” 38ft with Captain Abel spotted a Striped Marlin, over the Pacific in the 180 spot for Rob Standley´s group from Zionville, Indiana. This entry was posted in cabo san lucas, Fish Reports, Pisces Sportfishing, sportfishing and tagged cabo san lucas, fish reports, pisces on March 7, 2016 by Ismael Flores. BILLFISH: The Striped Marlin report increased a seven percent compared to last weekly report!, although the typical strong cooler winter winds coming from the North slowed a bit the fishing , still beautiful and nice to come down to Cabo and spend a pleasant vacation break reeling the fish of your dreams!. The “Andrea” vessel got tight lines for Billy and Michelle Kreft, Andy and Andrea Johnson visiting from Iowa releasing a Striped Marlin, one Dorado and five tunas outside of La Ballena over the Pacific side. “Tracy Ann” 31ft Pisces did great in a half day reeling a Striped Marlin at the Old light House for the group of Dustin Jackson from Jamestown, North Dakota. This entry was posted in cabo san lucas, Fish Reports, Pisces Sportfishing, sportfishing and tagged cabo san lucas, Pisces Sportfishing on February 10, 2016 by Ismael Flores. Marlin Being Caught with Live Makerel! Wahoo Hitting at Grey Rock! Dorado Fishing on the Upswing!! Sierras Showing up from Solmar to Pump House!! Inshore Fishing Hot: Pompano & Triggerfish! We are Gearing up for Springbreakers!! Oh Yellowtail Where are You! JC,s Baja Bloody Mary Recipe Inside!! 2 Baja Amberjack Recipes Inside!! JC Says: “I am the Admiral of Marlin Fishing in Cabo”! Chris Shouted: JC, You’re a Genius ! Fish Boy says: JC, You’re a Panzie Perch Killer!! JamieB says:JC, is the real Mcoy!! Darrel says: “God, That JC and Chris are both Twirps”!! The Brits says: JC, We Tolerate him. The Old Bloke is a Clown!! Fish Report Boy says: JC was a little quiet this week saying,“to many Spring Breakers in town”He said I was young once when I was fishing for Salmon in Alaska, and then I told him I was too young once also, when I used to fish for Bluegill in the ponds of Missouri. This entry was posted in cabo san lucas, Fish Reports, JC’s Sportfishing, sportfishing and tagged cabo san lucas, fish reports, JC´s Sportfishing on February 9, 2016 by Ismael Flores. This entry was posted in Fish Reports, Lastest Reports, Picante and tagged cabo, cabo san lucas, fish report, picante, sportfishing on October 25, 2013 by admin.